Do You Have This Much Passion? Are you trying to accomplish something wonderful? Then you know how hard this can be. As they say, it's easy to hit the bulls-eye if you're standing right in front of it. 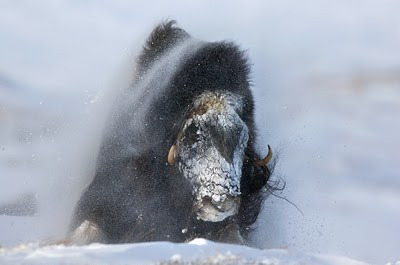 Check out this amazing picture by award-winning wildlife photographer Vincent Munier. It appeared on page 80 of the January-February 2011 issue of Audubon magazine. According to the blurb by Julie Leibach, Munier took this 2006 photo in the mountains of Norway in the middle of winter. He had tracked a herd of muskoxen for 10 days, pulling a sled and sleeping in a tent. Just before he took the picture, it was forty degrees below zero, and he had just survived a 116-miles-per-hour gale by curling into a ball on the ground. That's the price Munier paid to get this photo. What price are you willing to pay to get what you want? Do you have this much passion for what you're doing? Imagine what you could accomplish with that much drive, commitment and perseverance. I encourage you to visit Vincent Munier's website - www.vincentmunier.com - and appreciate what his kind of passion has produced. Munier's passion for his work and the lengths to which he has gone help put one's puny, "from a comfortable place" efforts into perspective. Thanks for my Sunday motivator! Did he ever get an award for that picture?